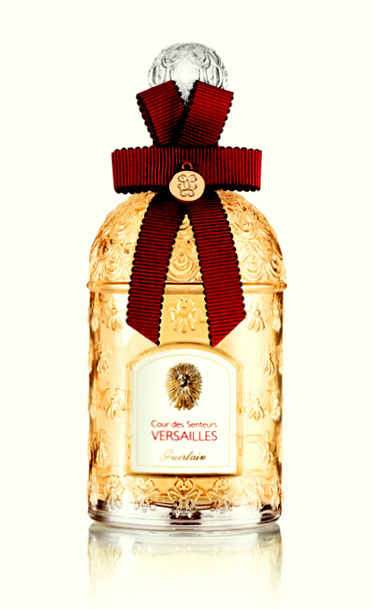 Cour des Senteurs: Versailles by Guerlain: launched in 2013. "Guerlain has just opened a new boutique in the Cour des Senteurs in Versailles, the former royal city near Paris. Situated in the heart of the oldest neighbourhood of Versailles, just a few steps from the Château, this unique space will bring increased renown to the ancient art of perfumery, both in France and abroad. In 1828 the founder of Guerlain set up shop on the ground floor of the Hôtel Meurice, the Paris residence of the royal family. He quickly became perfumer to Queen Marie-Amélie, wife of King Louis-Philippe and the last Queen of France. He also designed bespoke perfumes for a prestigious clientele, drawn from members of the international aristocracy. The ultimate recognition came in 1853, when Guerlain was designated Official Supplier to the Imperial Court for the Eau de Cologne he had created for Napoleon III’s wife Empress Eugénie of Montijo, a fervent admirer of Marie-Antoinette. The new Guerlain boutique is intended to be a contemporary homage to the skills of the French arts of perfumery and beauty. The boom in French luxury goods began in 17th-century Versailles through the impetus of Louis XIV, who took up official residence in the city in 1682. Factories were built and Louis XIV surrounded himself with the best craftsmen and artists of the time. Today, loyal to the spirit of the Sun King, the Château of Versailles regularly hosts exhibitions of the finest contemporary art. Visitors to the Guerlain boutique, which has two distinct spaces, enter through the Cour des Senteurs. The circular tympanum above the entrance recalls the triangular pediment that marks the entrance to the flagship Champs-Elysées boutique, Guerlain’s most famous and historic symbol. Visitors enter the soaring and majestic hall, where a bas-relief of the tree of life covers the walls. Its abstract design is composed of the names of perfumes and the dates when they were created. Given pride of place on the vast interior wall of the lobby is a 2.2-metre representation of the Guerlain astre. This famous symbol emblazoned the myriad array of different coloured papers used to wrap the famous Guerlain soaps, or sapoceti, and was also embossed on the C’est Moi powder compact, whose name was a reference to Louis XIV’s famous statement “L’Etat, c’est moi”. The king, protector and connoisseur of the arts, chose the astre, the emblem of Apollo, as the ultimate expression of his royal self. The astre, recreated in stone by sculptor Pierre-Louis Dietschy, evokes the source of life and appears to be watching over the premises as the guardian and protector of the arts. From the lobby, the visitor goes through to the Atelier des Parfums. This space is available for private guided visits, for both children and adults. The expertise of the great perfumer Guerlain is demonstrated through videos shown on screens embedded in the large table at the centre of the space. Visitors can listen to house perfumer Thierry Wasser explaining his art, watch the production of a Guerlain perfume bottle and the application of the traditional protective membrane and seal (baudruchage), and admire the fine manual skills of the Dames de Table making the Guerlain tassel, along with many other secrets from behind the scenes of this prestigious house, heir to the enduring tradition of fine perfumery. Guerlain decided to celebrate the memory of royal celebrations at the Château of Versailles with the creation of a unique perfume that is available exclusively at the Cour des Senteurs boutique. The splendor, radiance, enchantment and elegance of the royal festivities are crowned by the heady scent of solar jasmine. Le Nôtre’s gardens at Versailles were filled with many sweet-smelling plants including jasmine. Courtesans were fascinated by their fragrant flowers. Jasmine, which leaves an intense and bewitching scent in its wake, is the essence of perfumery. In the 18th century, men snorted snuff perfumed with jasmine. Marie-Antoinette’s perfumer, Jean-Louis Fargeon, made several scented waters, distillations and cosmetic creams scented with jasmine for the Queen, who was particularly partial to the fragrance. Inspired by the gardens of the Château of Versailles, Thierry Wasser chose the finest essences to create this perfume and its royal fragrant trail. The top notes of the perfume are the lively green scents of bergamot and galbanum. The beautifully noble Calabrian jasmine (Jasminum grandiflorum) leads the dance with its voluptuous sensuality, decked in fresh spring flowers of cyclamen and jasmine. Amber and white musk adorn the majestic trailing base notes with an unforgettable grace. This exclusive perfume is contained in an exquisite bottle adorned with the familiar Guerlain white bees. An elegant bow in red grosgrain ribbon edged in black embellishes the neck of the bottle. The bright red of the ribbon recalls the dazzling court of Louis XIV, who was the only member of the court permitted to wear red heels. The label, in pristine white, is emblazoned with the aster – the emblem of the Sun King and Guerlain’s own most celebrated symbol." If you are looking to try this fragrance but don't have access to the expensive flacon, fear not, this is the same juice as Guerlain's previous incarnation from 2011, Aqua Allegoria Jasminora. It is the exact same fragrance, concentration and composition.